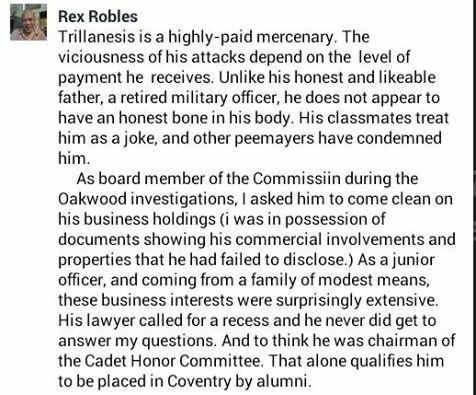 Former Philippine Navy Officer Rex Robles on his Facebook page called Senator Antonio Trillanes IV a "highly-paid mercenary". Robles said that the viciousness of Trillanes' attacks depended on the level of payment that he receives. Robles did not disclose the source of said payment. 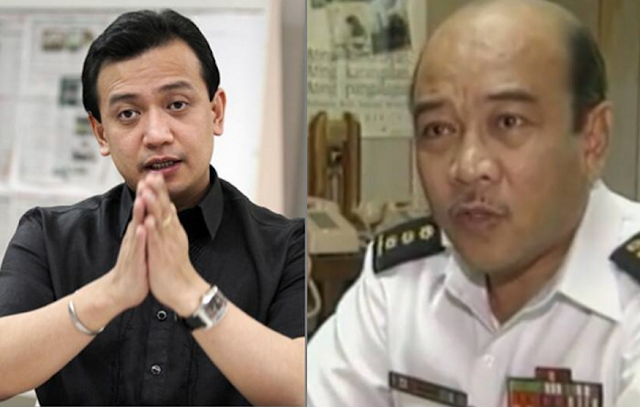 He said that unlike Trillanes' honest and likeable father who once served the military, he does not have an honest bone in his body, and that he was condemned and treated as a joke by his peers. The retired Navy Captain said that he was once a member of the Commissison on the investigations on the Oakwood mutiny where 321 soldiers took over Oakwood Premier Ayala Center to reveal the corruption of President Gloria Macapagal-Arroyo. He said that during these times, Trillanes was supposed to come clean on his business holdings since his businesses were extensive considering that he was just a junior officer from a family of modest means. He said that as a response, the senator's lawyer called for a recess and his questions remained unanswered,. "To think he was chairman of the Cadet Honor Committee. That alone qualifies him to be placed in Coventry by alumni."